TWINS RUN in our family: Marathons: The bigger, the better? Marathons: The bigger, the better? I began to wonder: the bigger, the better? there were less than 15,000 finishers! but I wonder if these will be my last "big" marathon. 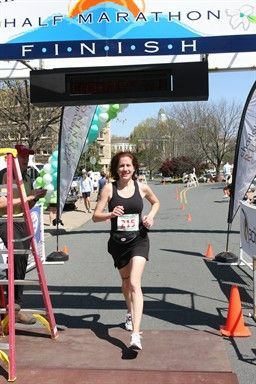 I ran the Charlottesville Marathon in 2009 (4:39:56). The field was so small, I ran by myself for most of the course. Would you rather run a "big" or "small" marathon? Congrats on BEST RUNNING BLOG! I don't know. I've only run two and those two were at Disney -- so I only know big. But I'm getting ready to run a smaller Half in a few months. That might be a good indicator. If it's pretty, I think a small marathon would be awesome. And love your cover photo. I've only run 3 halfs, 2 of them were at Disney, and one full which was our inaugural Rock and Roll in Savannah. It had about 18k people total, but about 13k were halfs that peeled off at mile 12 so the roads got more open for the rest of it. But I have done Cooper River Bridge Run which is 40k people and Peachtree Road Race which is the biggest race in the US with over 60k entries, but both of these are 10ks. It was pretty cool to be a part of such huge races but the stress factor was what bothered me before, getting there, traffic, parking, etc. But once there they all did excellent jobs with staging so running the actual race was not a problem. I just have to "get there." Conversely, running in small local races can be boring. We only have one local full and 2 half, and one of the halfs is at the same time as the full so I only have 5-10ks locally to compare to. They are great for the stress level pre race, but there is usually less going on during the actual race, good volunteers are a must, and then post race is kind of a let down, get your medal, get a bagel and water, and hobble to your car. So even though I stress much more pre-race on big ones of any distance, the spectacle of it all makes you feel like you truly are an athlete, so I'd have to say I like the mid to big races best for that reason. We've only run the big White Rock Marathon in Dallas...obviously there are way bigger races than that. But there's something to be said I think about both small and big races. Definitely think as a runner it's worth it to try both!